"I’ve not made a decision" regarding a military strike in Syria, stresses Obama in a television interview. 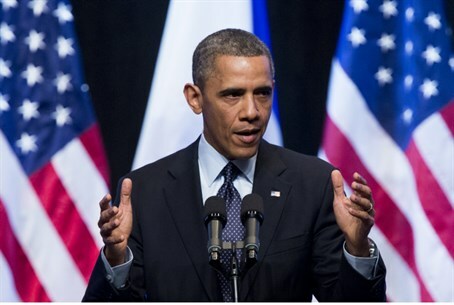 United States President Barack Obama said on Wednesday that he has not yet made a decision regarding a military strike in Syria. Speaking to PBS NewsHour, Obama stressed he has "no interest" in "any kind of open-ended conflict" in the civil war torn country. “I’ve not made a decision. I have gotten options from our military, had extensive discussions with my national security team,” he said. “This is a volatile country in a very volatile region. We’ve got allies bordering Syria. Turkey is a NATO ally, Jordan a close friend that we work with a lot. Israel is very close by. We’ve got bases throughout the region. We cannot see a breach of the non-proliferation norm that allows, potentially, chemical weapons to fall into the hands of all kinds of folks,” he added. “So we are consulting with our allies. We’re consulting with the international community. And you know, I have no interest in any kind of open-ended conflict in Syria, but we do have to make sure that when countries break international norms on weapons like chemical weapons that could threaten us, that they are held accountable,” said Obama. The interview with PBS was made as speculations continue on whether Obama will order a strike in Syria because of last week’s chemical attack. The White House said, according to a Tuesday report in the Wall Street Journal, that the goal of any action would not be regime change in Syria but to respond to the alleged use of chemical weapons, which it argues presents a national security issue to the United States. Meanwhile, the United States and Britain have come under pressure to delay military intervention in Syria, with United Nations Secretary-General Ban Ki-Moon urging both countries to hold fire. Speaking at a press conference at The Hague, Ban called to give UN inspectors more time to examine the scene of the chemical weapons attack near Damascus last week. He said that the inspectors needs at least four days to conduct tests, and further time to finish analyzing the results. Once that is done, the matter should be taken to the UN Security Council, he added.